The Florida Cooperative Land Cover Map (CLC) is a partnership between the Florida Fish and Wildlife Conservation Commission (FWC) and Florida Natural Areas Inventory (FNAI) to develop ecologically-based statewide land cover from existing sources and expert review of aerial photography. The CLC was originally funded by the Florida�s State Wildlife Grants program in support of The Florida State Wildlife Action Plan which identified improved habitat mapping as a priority data gap. The CLC follows the Florida Land Cover Classification System. Beginning with the release of CLC v3.0, the Cooperative Land Cover Map will be revised continuously, with new versions being released every 6 � 12 months. 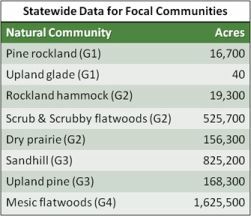 FWC now takes the lead on updating and maintaining the Cooperative Land Cover map, while FNAI continues to provide guidance for the classification of natural communities, and site specific data sources based on their mapping and revision efforts. Feedback from users of the data is welcome, and users are encouraged to report data errors to landcovermap@myfwc.com.